It is heartening to see more and more examples of everyday technology improving the lives of everyone in our community. 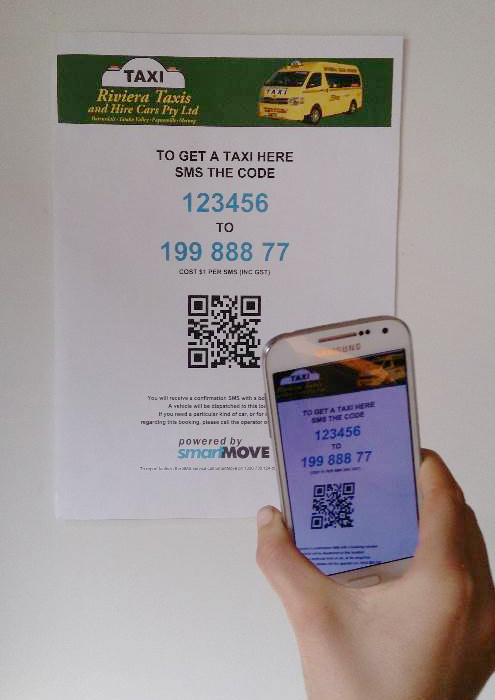 “Talking Taxis – East Gippsland” assists passengers with calling a taxi using a QR code and their smart phone. The common smartphone used with QR codes is one such technology. QR codes are a new type of barcode that can be scanned with a smartphone and it provides information. QR codes can often be found in advertisements to provide extra information or take you to the website of the product being advertised. This technology can do so much more. I would like to share a project “Talking Taxis- East Gippsland” in which QR codes are being installed in the city of Bairnsdale in East Gippsland, Victoria, to assist passengers in calling for a taxi. The passenger can use their smartphone, with any scanning app, to read a taxi QR code and a taxi is sent to their location. The benefit of using to improve the general efficiency of taxi services and for economic advantage, it has huge advantages for people with disabilities to enable independence in calling for a taxi. The “Talking Taxis – East Gippsland” project has been made possible through the partnership of the Gippsland Regional Communication Service, which is part of the state wide CAN network, the East Gippsland Shire Council, Local Taxi service provider Riviera Taxis and a local adult training and support service Noweyung Ltd. This entry was posted in Uncategorized on May 22, 2014 by crcscope. The Bendigo Health Regional Communication Service has been very fortunate over the past 8 years since it was launched on March 7 2006. It has had one consistent speech pathologist, so it has been able to develop seamlessly over this time. 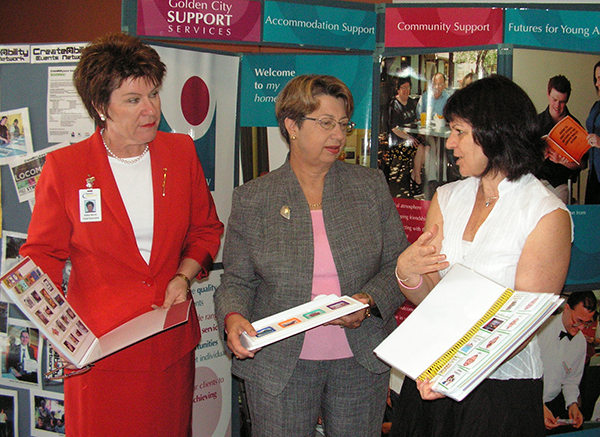 The Bendigo Health Regional Communication Service Launch, March 7 2006. Barbara Solarsh with Hon Minister Sherryl Garbutt (Minister of Community Services- middle) and Kathy Burne, CEO of Bendigo Health. I came to Australia 10 years ago, fresh from a number of years in which I was intensely involved in community development work in rehabilitation in poor rural areas of South Africa. If I learnt one thing from this experience, it was that community development is a long term commitment and thrives with continuity and consistency. When changes must occur, as they inevitably do, disruption can be avoided when the transition is seen to be just as important as the ongoing work. This applies fully to the capacity development model of CAN. With this in mind, I am planning a transition, as my departure from Bendigo at the end of 2014 becomes more real. The Bendigo Health Regional Communication Service has been very lucky as Merrin Hurse, from the Communication Resource Centre, has relocated to Castlemaine (a 20 minute drive from Bendigo) and after successfully going through the selection process has been appointed to my position. I could not have wished for a better replacement as Merrin is steeped in the work we do. So, let me introduce Merrin to you all. 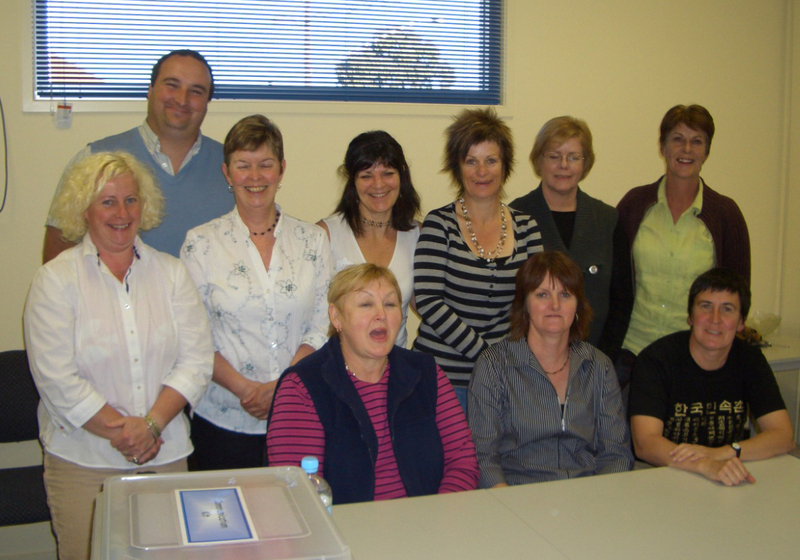 2007- the first group of Communication Coordinators to be trained. Though none are still fulfilling this role, four have moved into training and management roles. Merrin will be a great asset to the Loddon Region. She works two days a week as the Victorian representative for Liberator Pty Ltd. Liberator are an Australian supplier of high tech speech generating communication devices, so if anyone in our region needs high tech resources Merrin will be able to provide fantastic input and services. For the past four years, Merrin has provided speech pathology consultancy for a disability support service, working in collaboration with the communication coordinator there, so she is already experienced with our model of service delivery. She has also provided speech pathology services to adult clients with acquired brain injuries and their families, who receive funding through Slow to Recover and Individual Support Packages. And that’s not all! Merrin has extensive experience translating written information into Easy English for customers. Part of this process had included working with consumers to get feedback on draft Easy English documents. She has also delivered Easy English training to equip participants with skills to develop their own documents. Merrin has previously presented a webinar, at our Communication Coordinator Network meeting last December, on the SPELL program for people with Autism. She has also been involved in Communication Access assessments and will continue to promote and develop this in our region. And more than that, Merrin is just terrific, fun to work with, interested in social media and apps, and is looking forward to meeting everyone over the next few months. By mutual agreement, Merrin and I will job share until the end of 2014. She will do two days and I will do one day per week. In this time, Merrin can observe the six days of Communication Coordinator training, and offer the August program. She will be able to observe almost every aspect of the work, be introduced to everyone in the region, and start generating her own ideas and new initiatives. 2013 – and the training continues! 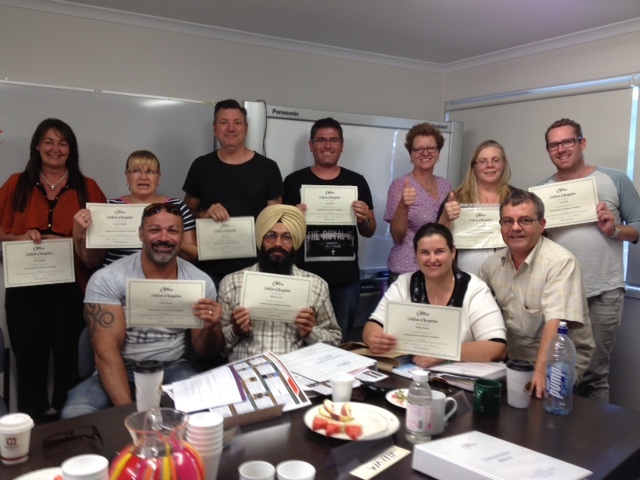 The most recent group of 9 participants completed their training on March 26th 2014. Next training scheduled for August 2014. Before the training ends there is one last message I always give the Communication Coordinators and Facilitators and that is – you may move on at some time, that’s fine, but inform me, and with your manager we will put someone else in your place as soon as possible, so there is no lapse in the service. Continuity is important at all levels. When I wrote to tell everyone the news of my departure, I said that the greatest gift they could all give me, was for me to return to Loddon in 10 years time and find Communication Coordinators and Facilitators active, engaged and providing a great communication service to people they support. I have every confidence that under Merrin’s guidance this will be possible. This entry was posted in Uncategorized on May 5, 2014 by crcscope.